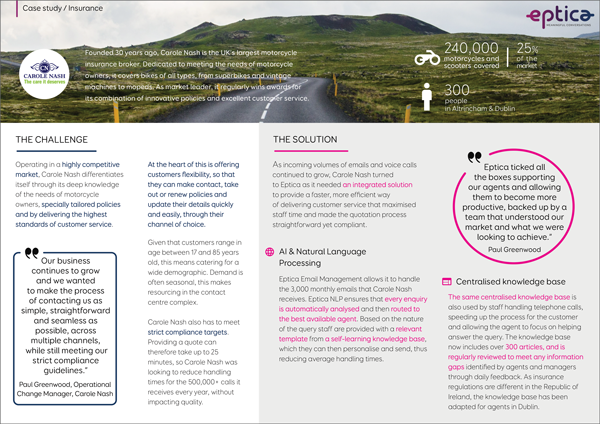 Carole Nash Case Study | Eptica - Multi Channel Customer Interaction Software. Email Management. Web Self-service. Live Chat and Agent Knowledgebase. Carole Nash is the UK’s largest motorcycle insurance broker, providing cover for around 240,000 motorcycles and scooters – around one in four of all such machines on the road. Dedicated to meeting the needs of motorcycle owners, it covers bikes of all types, from superbikes and vintage machines to mopeds. It regularly wins awards for its combination of innovative policies and excellent customer service.